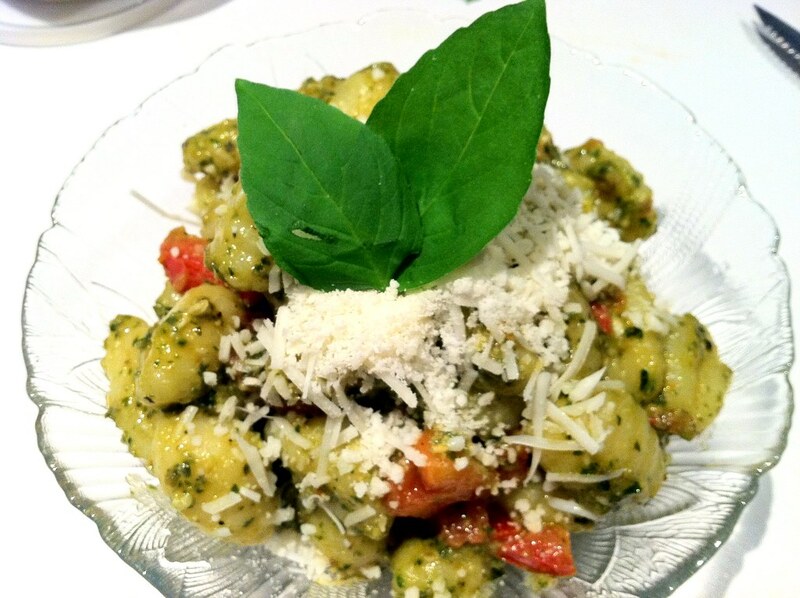 Recipes for Old People – gnocchi with pesto – ugly food tastes better. …and people that have been to the dentist to get work done TWICE this week. My face is swollen, I’m fussy and hungry and I can’t really chew. I have been dreaming of making from scratch gnocchi but we didn’t get potatoes at CSA pickup, and I feel horrible and woozy from the dentist. But I have CSA pesto, some basil that needs trimming, and some amazing plum tomatoes. And I live in an Italian neighborhood, so I can get good fresh ones on the corner. So the homemade kind will have to wait. This is more of a CSA food-sharing post than a recipe, but a good first dish for the cook book I am working on..Chapter One, Recipes for Old People. They don’t have enough cookbooks!! Boil your water and add gnocchi, take them out with a slotted spoon as they float. Rinse in cold water and add back to the pan and stir in pesto, heat to warm, and add a sprinkle of cheese an diced tomatoes tossed in pepper, plate with grated cheese and basil on top! Enjoy! 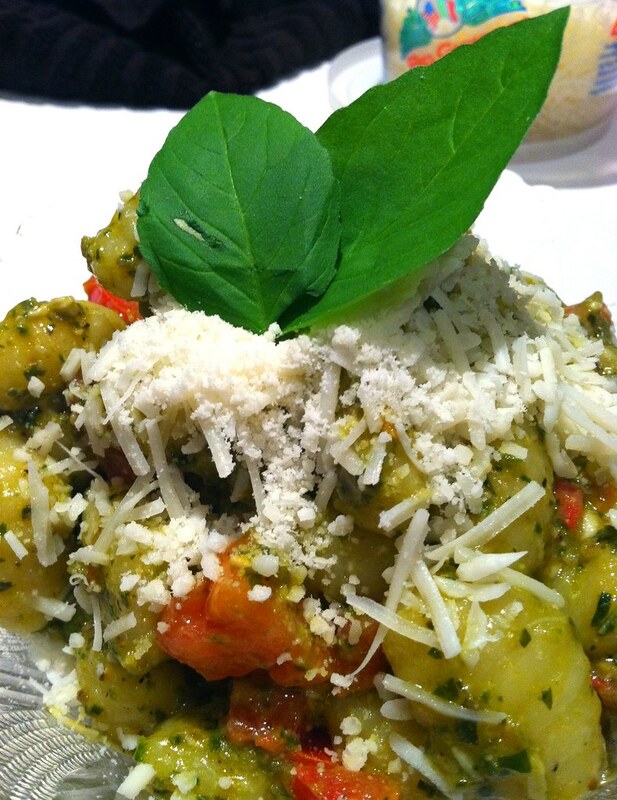 When you don’t have potatoes… make ricotta gnocchi! This looks soooo good. For some reason I never really make gnocchi with pesto – clearly an oversight that needs to be fixed asap. Dont tell anyone that I said this….but i am not a huge ricotta fan. This year I have started liking it as a base for muffins and breads, but I am still not a fan of it on its own or as the main flavor in anything. Do you have a recipe for ricotta gnocchi on your blog though? I’d love to see how its done! Actually I don’t yet – although I should – I make them often enough! I think the thing with ricotta is that most of the store brands aren’t very good. They’re a little gritty. Although they can definitely be good as a base for things (like adding into baked goods, or mixing with other stuff to create a filling). Usually when I’m doing something where you’re actually going to taste the ricotta, though, I make my own. It’s really really easy to make and tastes about a billion times better than anything you can buy in a store. I have to admit it: I make crappy gnocchi. I always dream of making the light and fluffy ones, and seem to only be able to make pellets that could double as rubber bullets. Sigh. I think I need a demo too! But I do actually love the idea of food for old people! Which might be really close to food for babies, but with different flavors! I hope that you have fully recovered from the dentist (two trips, oh my! ), and are back to chewing! yeah I made ricotta once, it was crazy easy, and yeah i would never touch the weird store bought stuff, fortunately my butcher’s mom makes several cheeses and sells them so i can continue to be NYCspoiled haha. ps. you get pesto in your CSA??? I’m writing a letter to mine! haha yeah i signed up for a “locavore shopping basket” share so I will get pesto, pickles, flours, grains, cereals and what not. Should be exciting!